Kiev is known for museums, historic sites, nature, nightlife, and parks. Your plan includes some of its best attractions: contemplate in the serene atmosphere at Kiev-Pechersk Lavra - Caves Monastery, don't miss a visit to Andriyivski Uzviz, appreciate the history behind Rodina Mat (Motherland), and examine the collection at Pirogovo Open-Air Museum. To see more things to do, maps, reviews, and other tourist information, you can read our Kiev trip maker tool . San Diego, USA to Kiev is an approximately 19.5-hour flight. You can also do a combination of flight and shuttle; or do a combination of train and flight. Due to the time zone difference, you'll lose 10 hours traveling from San Diego to Kiev. Prepare for much colder weather when traveling from San Diego in March: high temperatures in Kiev hover around 46°F and lows are around 32°F. Finish your sightseeing early on the 25th (Mon) so you can take a train to Vinnytsya. Vinnytsia is a city in west-central Ukraine, located on the banks of the Southern Bug.It is the administrative center of Vinnytsia Oblast and the largest city in the historic region of Podillia. Start off your visit on the 26th (Tue): engage your brain at Science Museum, contemplate in the serene atmosphere at Jesuit Monastery, then examine the collection at Museum of Retro Technology Avtomotovelofotoradio, and finally admire the masterpieces at Vinnytsya Museum of Art. Get ready for a full day of sightseeing on the next day: admire the landmark architecture of Vinnytsia Water Tower, tour the pleasant surroundings at Gorky Park, then make a trip to Sabarovskaya Hydroelectric Power Station, and finally admire the local landmark of Multimedia Fountain Roshen. To see more things to do, traveler tips, reviews, and more tourist information, you can read our Vinnytsya trip planner. You can take a train from Kiev to Vinnytsya in 2.5 hours. Other options are to do a combination of shuttle and flight; or drive. 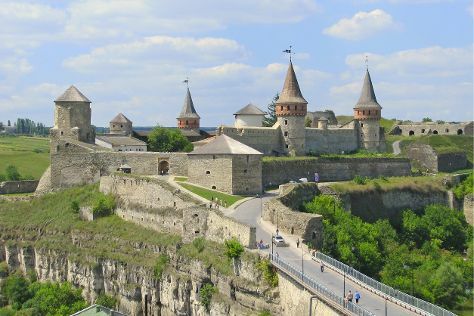 Finish your sightseeing early on the 27th (Wed) so you can drive to Kamianets-Podilskyi. Kamianets-Podilskyi is a city on the Smotrych River in western Ukraine, to the north-east of Chernivtsi. Start off your visit on the 28th (Thu): make a trip to Strimka Lan Bridge, make a trip to The Russian Gate With Fortifications, enjoy breathtaking views from Honcharna Tower, then make a trip to Turkish Minaret, then step into the grandiose world of Khotyn Fortress, and finally explore the historical opulence of Kamenet's Podolsky Castle. Keep things going the next day: don't miss a visit to Kamianets-Podilskyi Gallery of Arts, don't miss a visit to The House of the Russian City Council, then pause for some serene contemplation at Cathedral of the Saints Peter and Paul, then take in the architecture and atmosphere at Church of Peter and Paul, and finally pause for some serene contemplation at St. George Cathedral. To find traveler tips, ratings, more things to do, and tourist information, read our Kamianets-Podilskyi trip itinerary planning app . You can drive from Vinnytsya to Kamianets-Podilskyi in 3 hours. Other options are to take a bus; or take a train. March in Kamianets-Podilskyi sees daily highs of 48°F and lows of 34°F at night. Wrap up your sightseeing on the 29th (Fri) to allow time to drive to Chernivtsi. Chernivtsi is a city in western Ukraine, situated on the upper course of the River Prut. 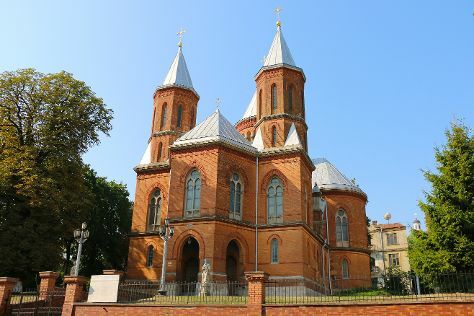 Chernivtsi is known for historic sites, museums, parks, and nightlife. 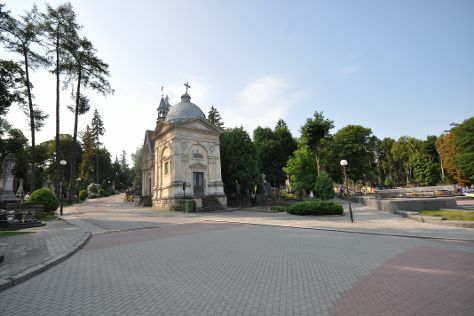 Your plan includes some of its best attractions: admire the landmark architecture of Residence of Bukovynian Metropolitans - Chernivtsi National University, take in the architecture and atmosphere at St Nicholas Cathedral, make a trip to Teatralna Square, and wander the streets of Olha Kobylyahska Street. To find photos, more things to do, and more tourist information, refer to the Chernivtsi day trip website . Getting from Kamianets-Podilskyi to Chernivtsi by car takes about 1.5 hours. Other options: take a bus; or take a train. In March, daily temperatures in Chernivtsi can reach 48°F, while at night they dip to 34°F. Wrap up your sightseeing on the 1st (Mon) early enough to drive to Uzhhorod. Uzhhorod is a city located in western Ukraine, at the border with Slovakia and near the border with Hungary. Explore Uzhhorod's surroundings by going to Mukacheve (Palanok Castle, Church of Pochaiv Madonna Icon, & more). Next up on the itinerary: don't miss a visit to Liberty Mini-sculpture, pause for some serene contemplation at Cross Exaltation Cathedral, and examine the collection at Jozsef Boksay Art Museum. To find photos, reviews, traveler tips, and tourist information, use the Uzhhorod trip planner . Getting from Chernivtsi to Uzhhorod by car takes about 6.5 hours. Other options: take a train; or take a bus. Due to the time zone difference, you'll gain 1 hour traveling from Chernivtsi to Uzhhorod. In April, daily temperatures in Uzhhorod can reach 61°F, while at night they dip to 41°F. Finish your sightseeing early on the 4th (Thu) to allow enough time to drive to Lviv. Lviv is known for historic sites, museums, nightlife, shopping, and parks. Your plan includes some of its best attractions: don't miss a visit to Market Square, explore the different monuments and memorials at Lychakiv Cemetery, see the interesting displays at Insomnia - The Haunted House, and take a stroll through Old Town. For photos, more things to do, and tourist information, read our Lviv trip planner . You can drive from Uzhhorod to Lviv in 4 hours. Other options are to take a bus; or take a train. You'll lose 1 hour traveling from Uzhhorod to Lviv due to the time zone difference. In April in Lviv, expect temperatures between 57°F during the day and 39°F at night. Finish up your sightseeing early on the 7th (Sun) so you can travel to Odessa. Odessa is known for museums, nightlife, fun & games, zoos & aquariums, and parks. 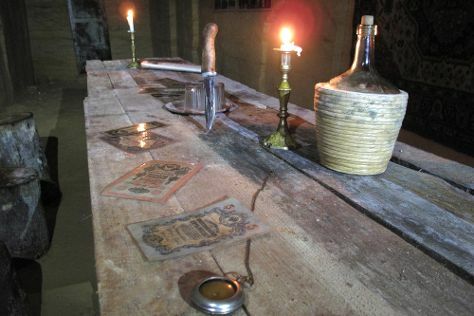 Your plan includes some of its best attractions: make a trip to Deribasovskaya Street, examine the collection at Secrets of Underground Odessa Museum, test your team's savvy at popular escape rooms, and meet the residents at Odessa Delphinarium Nemo. To find maps, photos, where to stay, and tourist information, you can read our Odessa travel route planner . Traveling by flight from Lviv to Odessa takes 5 hours. Alternatively, you can drive; or take a train. In April in Odessa, expect temperatures between 57°F during the day and 44°F at night. Finish your sightseeing early on the 10th (Wed) so you can travel to Kharkiv. Kharkiv is known for parks, historic sites, nightlife, museums, and wildlife. Your plan includes some of its best attractions: tour the pleasant surroundings at Gorky Central Park of Culture and Leisure, identify plant and animal life at Kharkov Dolphinarium, ponder the design of Mirror Stream fountain, and pause for some serene contemplation at Annunciation Cathedral. To see traveler tips, other places to visit, reviews, and other tourist information, refer to the Kharkiv trip itinerary planner . Traveling by flight from Odessa to Kharkiv takes 5.5 hours. Alternatively, you can drive; or take a train. In April, plan for daily highs up to 59°F, and evening lows to 40°F. Finish your sightseeing early on the 13th (Sat) so you can travel back home.